We would like to introduce you to the sport of Dog Agility. You may have watched on Animal Planet dogs zooming through tunnels, flying over jumps, climbing A-Frames, through closed tunnels and whizzing through those weave poles. 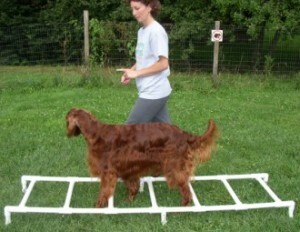 Agility is a sport in which you and your dog compete on a timed obstacle course. This great sport began a litter over 15 years ago and is among one of the fastest growing sports all around. One of the important commands your dog needs to know is how to COME. All dogs must as always be properly socialized and get along good with other dogs and people. There should be no aggression in this sport. Basic obedience commands as sit, down and stay are also of importance. It is important not to jump young puppies as their bones are not fully formed and a permanent injury may result. One of the most important tips to remember is to not rush your dog. It may seem like a simple thing for your dog to go over a jump, but this is unknown territory for your dog and you must respect it. 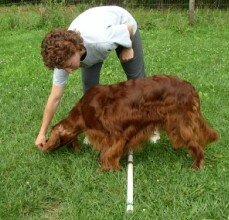 If he is afraid and you force the issue you may ruin your dogs’ chances in agility. Think of it as you being afraid to get into a swimming pool because the water is cold and then once you are in you don’t want to get out. That is how agility is with the dogs. Once they are allowed to test the waters, they will never want to quit. 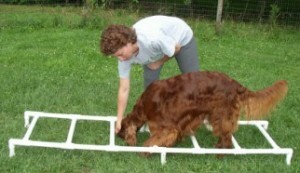 Here are some tips you can do at home to prepare your dog for agility. Go to the local hardware store and buy a four foot long, one inch PVC plastic pipe. Always practice a little obedience first with your dog so you have their attention and to warm up their muscles. Do not jump a dog before warmed up. Set your pipe flat on the ground. If he wants to sniff it let him. Keep your dog on a four foot leash a buckle collar and just casually walk over the pipe with your dog, praise him like he did the best thing ever in the world. Start using the word Jump. Soon you can run along side the jump and just have your dog jump over with the command Jump. Once you are sure he understands the word jump, try it try it without the leash. Never use a choke collar or a prong collar. In Agility we never use negative corrections. Never use the word “NO” when approaching equipment. Keep it fun. Once they have mastered the pipe on the ground you may raise it. A simple way is to take 2 one gallon milk jugs, one for each end, cut a ½ circle off the top so your pipe may rest on the lip. You can add sand to sturdy them. Be sure the pipe can easily be knocked off to avoid injury. Never push your dog to jump higher than recommended heights. Example: an 8 inch dog, jump at 4 inches, a 20 inch dog at 10 inches. Once you are in a class you will be guided by your instructor as to what jump height you should jump. I recommend that any thing more than jumping should be trained to you by a professional trainer with experience and one that only uses positive reinforcement training. Another easy thing to do at home is use a ladder, preferably wooden. This one shown is made out of PVC pipe. Again start slowly by putting the treats inside each rung and let your dog find them and follow to the end. It’s ok if he pops out in the beginning, just continue using encouragement treats and lots of praise. Once your dog is confident you may stand up and walk alongside him/her.